With the number of Japanese knives that I own, it almost seems that I am also starting to collect Japanese knives. I’ve made a few more additions to my knife list since my last post about it. This first one is not technically a knife, but rather a pair of scissors. Back when I was young, I’ve used many different scissors, some are really good and some average. After I started to live in Canada, I’ve got accustomed to the $5 disposable safety scissors that I forgot what a fine pair of scissors feel like. Well, that is until I saw this pair of scissors. This is DDS-170 Sakura Scissors by MCUSTA. The scissors came in a nice wood box. 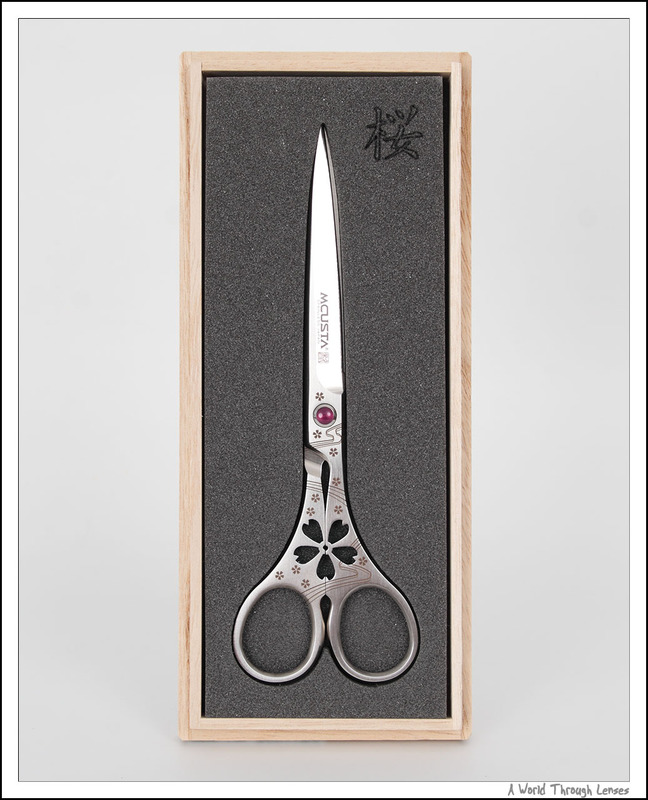 Open the box and you see the scissors encased in foam with Sakura kanji cut out on to top right. MCUSTA have made a very limited run of VG10 damascus version of this very same scissors (I think it was limited to 10 pieces). I was not fortunate enough to get my hand on one of that. However, I did manage to get the normal stainless steel version with the exact same design. And this is what the scissors looks like. This is definitely not your $5 safety scissor. 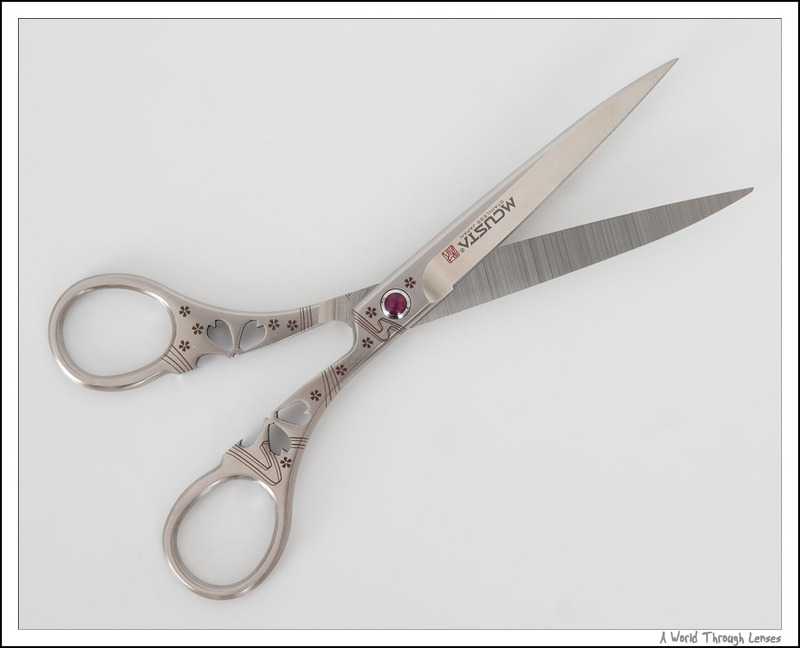 This pair of beautiful scissors are precision built tools. The fine edge gives a really accurate cut to papers and other things. This is going to make a really good tool for making paper craft or other kind of hobby craft that requires accurate cuttings. And like any well built scissors, it can be disassembled into two pieces for a proper sharpening. Now back to knives. More than a year ago, I’ve made a previous post on my 105mm petty knife from Echizen Japan. My girlfriend really fell in love with the lightness of that knife as well as the beautiful core-less damascus pattern. So when I informed her that Echizen Japan also makes a bread knife in the same series, she said I should buy one so she can use it. And here it is. 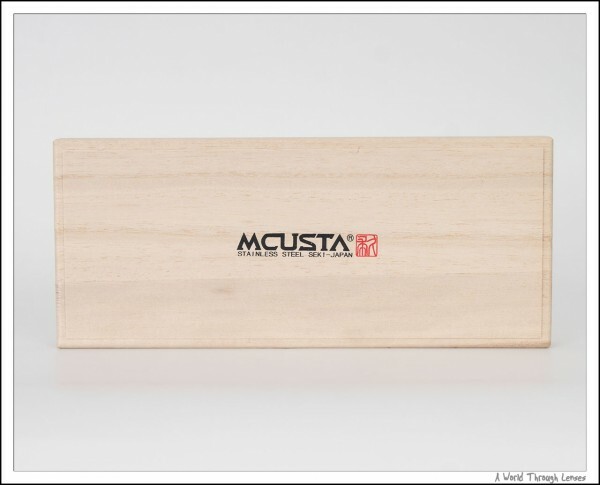 Just like the 105 petty knife, the bread knife came in a beautiful wood box. Here is the knife in its nice foam cutout inserts. 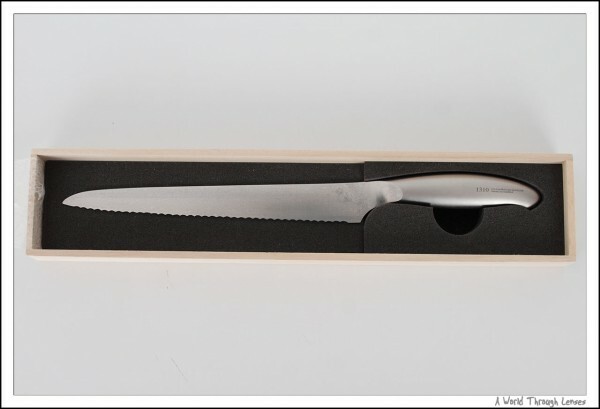 The bread knife is essentially the same design as the petty. 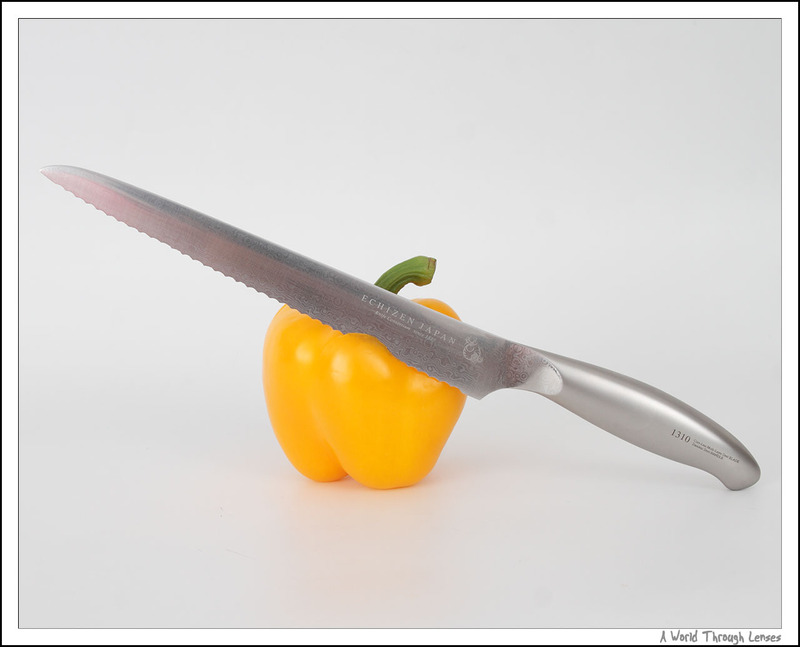 They both have a hollow one piece integrated handle where the blade seamlessly merges onto the handle. The knife is very light at 127g for a 335mm long knife. The lightness of the blade is just fine for petty and bread knives. But I definitely want a heavier knife as my chef’s knife. Here’s a close up of the interest wave and dots pattern that’s produced from the layers of VG2 and VG10 steel. The pattern extends the full blade and up to the front part of the integrated handle. The handle actually feels very good in the hand, but since it is integrated, you cannot change the handle even if you wanted to. 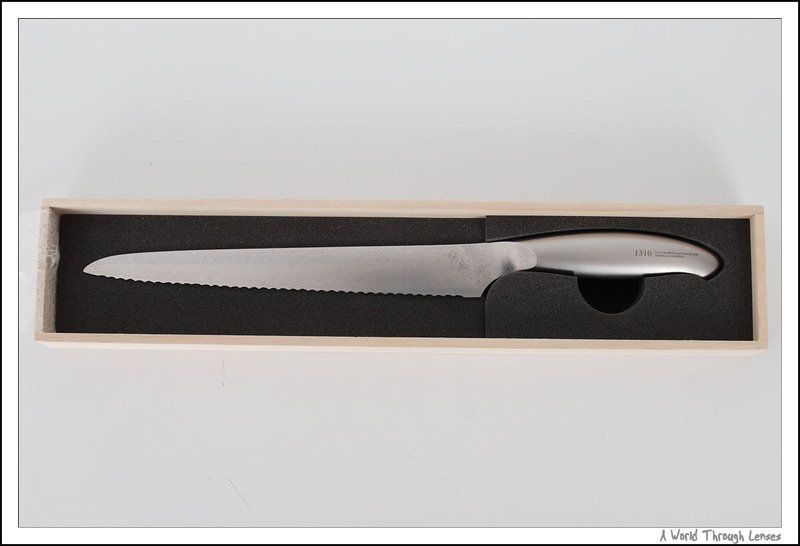 Now if you think that Echizen bread knife is special, this last knife is even more special. This knife took me just over 5 months to get the specially made. I placed the order on December 14th, 2011 just before Christmas last year. It supposed to take about 2 months for the knife to be made for me. Apparently there was a miscommunication on the design of the knife and so when the knife arrived in Feb, it has to be sent back and remade from scratch. It has finally arrived from Japan to Canada on May 16th 2012. And here it is. 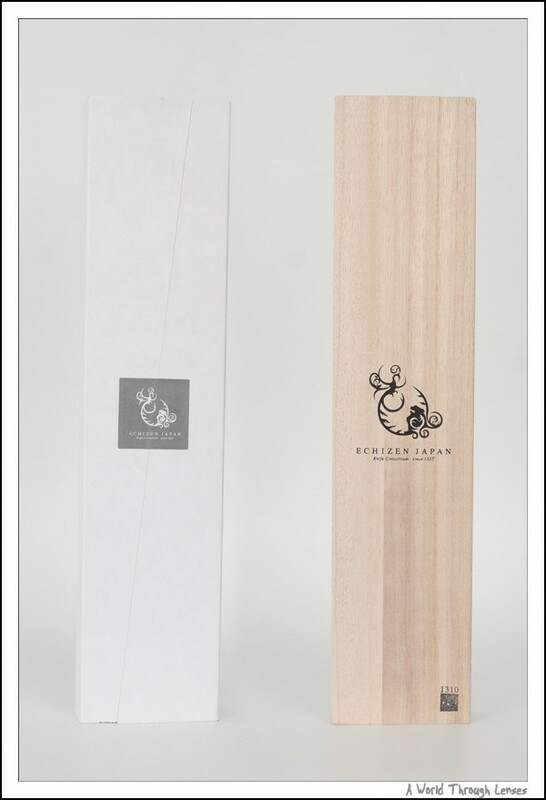 Hmmm… For those who knows, looks just like a Konosuke Sujihiki with a slightly different handle right? Here it is after I take it out of the saya. 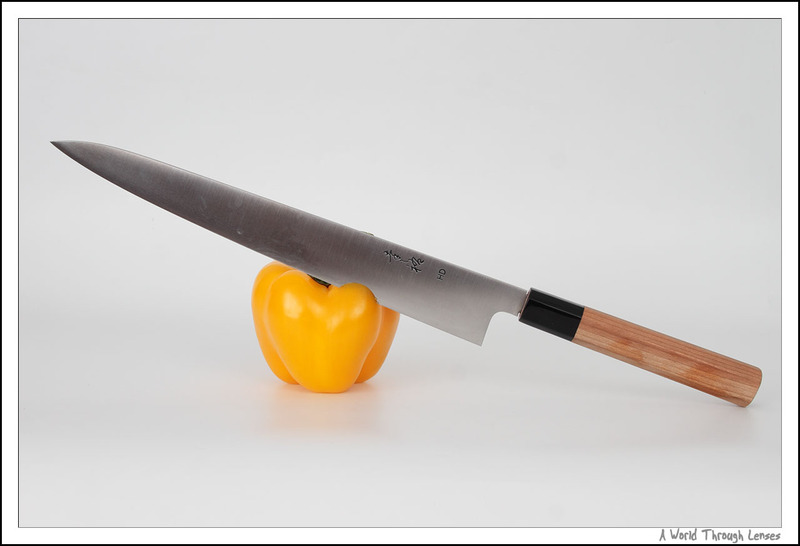 Yep, looks like a 300mm sujihiki from the Konosuke HD series. 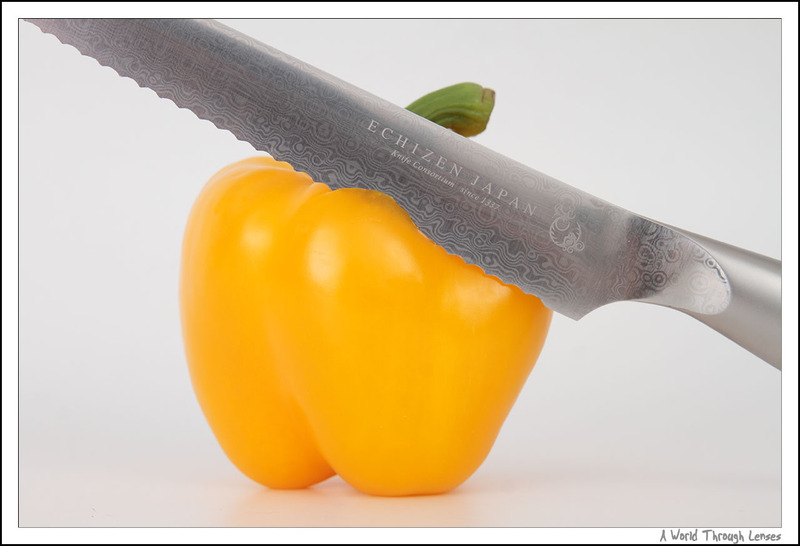 Sure the handle is a bit different but the marking on the knife is no doubt a Konosuke HD. 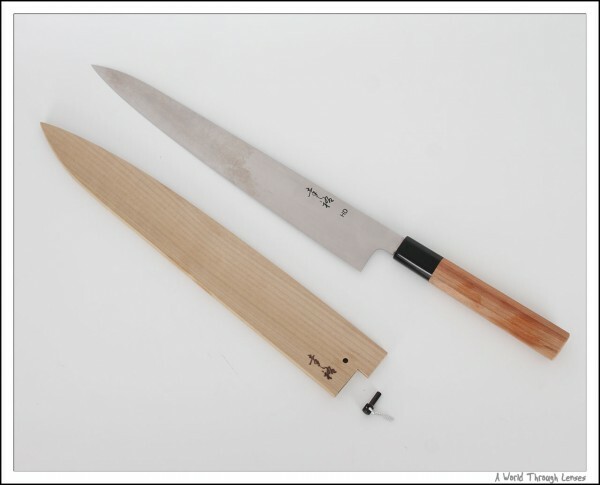 For those who are not into Japanese kitchen knives, a Sujihiki (筋引き) is basically a Japanese slicing knife. It shaped a bit like a Gyuto (牛刀) but narrower. 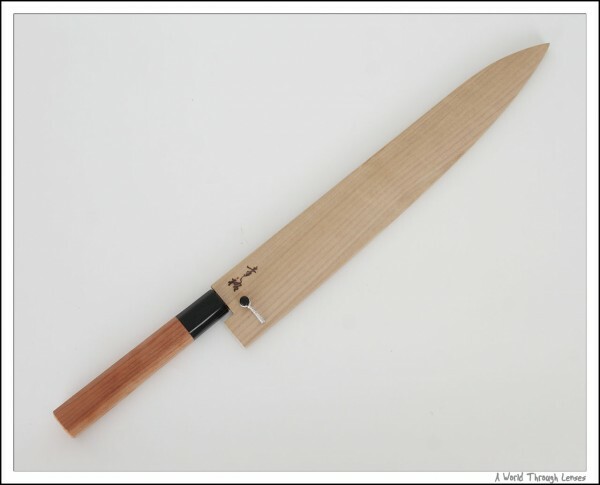 I own a 240mm Gyuto but since then have been itching for a 300mm slicer for fishes and meats. But when you flip the knife over, you will see why this one is a special knife. 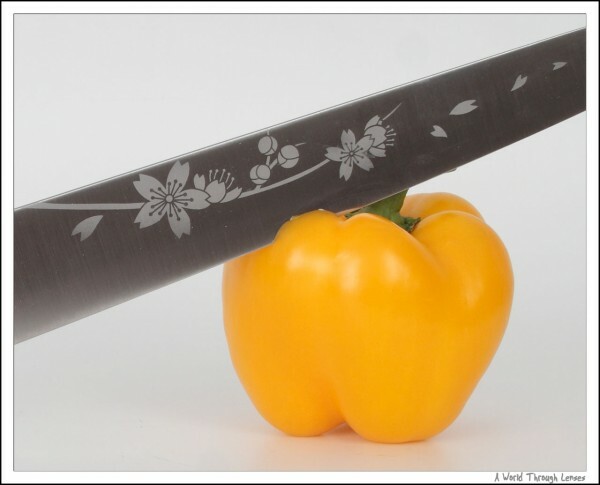 The right side of the knife is etched with a sakura patten that Konosuke has used on their Sakura and Night Sakura series. 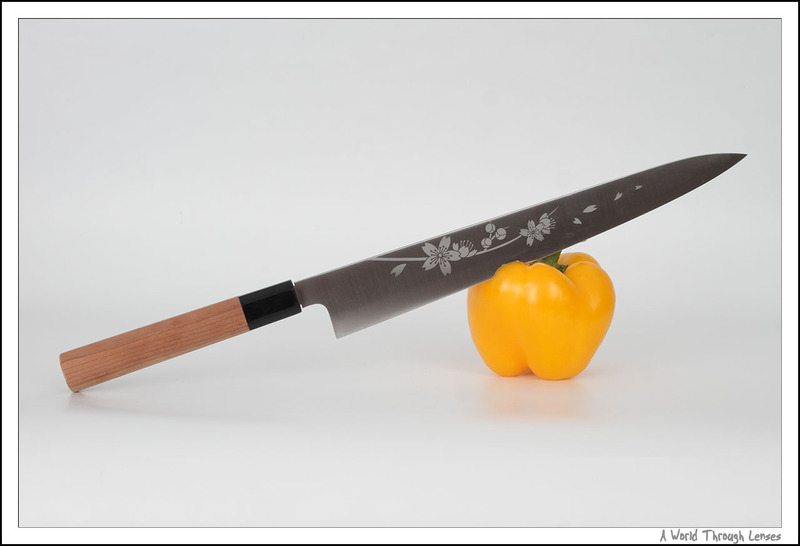 I fell in love with that sakura pattern, but the only knives available with that pattern are Yanagiba, Gyuto and Petty. And I really wanted a 300mm Sujihiki. So I had Konosuke custom made this knife for me. It’s a regular Konosuke HD series Sujihiki blade, black buffalo horn ferulle, and sakura (Japanese cherry blossom) pattern etched on the right side, and finally a cherry wood handle to keep it in the cherry blossom theme. And here’s a close-up of the Sakura pattern etched into the knife. Isn’t that one of the most beautiful knife you have ever seen? And how does the knife perform? It performs really well. Here’s a video of this knife slicing through tomato. I know the knife technique are pretty bad here. Due to the way I took the video by myself, I was in an awkward position with my arm fully extended. So a proper knife technique wasn’t possible. But at least you get a sense of what this knife can do.